The blocking of the accounts of municipal enterprise Kyiv Metropoliten within the framework of executing court rulings on debt payment to Ukrrosleasing forces Kyiv to agree on restructuring this debt, Kyiv Mayor Vitali Klitschko has said. "We have no choice but to talk about restructuring," he told Interfax-Ukraine on the sidelines of the 15th YES forum organized by the Victor Pinchuk Foundation in Kyiv on September 13-15. 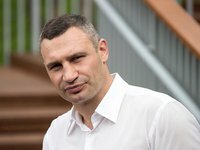 At the same time, Klitschko said he had not yet met with the new Austrian owner of Ukrrosleasing and had not discussed possible terms of restructuring. As reported, the new owner of Ukrrosleasing LLC (Kyiv), to which municipal enterprise Kyiv Metropoliten owes about UAH 2 billion according to court rulings, through Hungary's ODELUS-Construkt Kft. (Gyor) became Uwe Christian Eschner, the owner of 80% in FIS Capital GmbH (Vienna).